Global game publisher Reality Squared Games (R2Games) has released the first gameplay teaser for Stormthrone: Aeos Rising, giving players a highly anticipated first look at the browser MMORPG in action. R2Games welcomes veterans and new fans alike to the official Stormthrone site, where the gameplay teaser is joined by the first round of Stormthrone minigames, giving players a chance to earn Pyrum and other bonuses for their characters before the Alpha begins. The Stormthrone trailer reveals an MMORPG that transcends the minimal interactivity and passive combat all too common in the browser. The war for Aeos is a dynamic battlefield, and victory requires focus, coordination, and real-time skill. 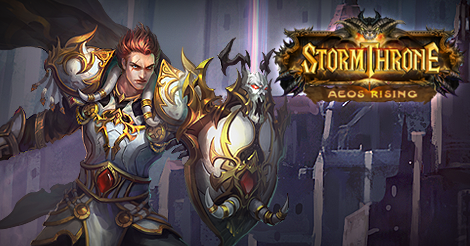 Whether players seek their fortunes solo, delve into deadly multiplayer dungeons, or try their hand at world-spanning PvP events, Stormthrone raises the bar for browser MMOs. When the heroes of Dawnhold unleash the long-lost Aeon Weapons, demons will fall before their combined strength! Stormthrone’s minigames give players an early chance to enhance their Alpha experience. Those who master the daily challenges of Stormthrone Sweets and Stormthrone Spins will earn points towards exclusive item and Pyrum codes, redeemable as soon as the Alpha launches. The Exchange Points function will launch on November 18th at 8:00 AM EST, and new Stormthrone minigames will be released each week before then. Now that the doors to Aeos are just a little more open, R2Games anticipates enthusiastic response by the growing Stormthrone fanbase. Since item codes will be limited, players would be well-advised to collect as many points as possible before the function launches. Asmodee Digital and Fantasy Flight Interactive moved The Lord of the Rings: Living Card Game into Early Access on Steam for PC/Mac. To celebrate the 10th anniversary, the Flyff team has launched a skip level event that allows players to receive a free level boost.